The diagram below depicts Insight’s typical network topography. The IVR system is connected to a telephone network through which it can send and receive calls. 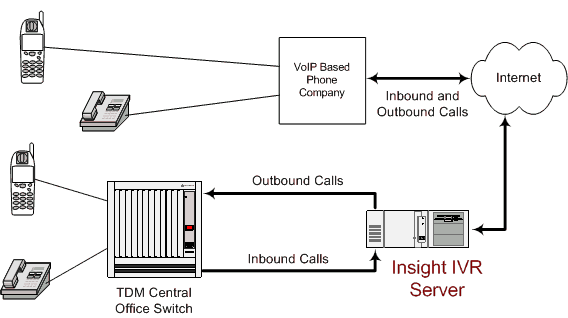 Since Insight now supports direct VoIP connectivity, your system can also be stationed anywhere with an Internet connection. For example, a call originating from India can terminate directly via IP to an IVR Server in the United States. Copyright© 1984-2014 Parwan Electronics Corp. All rights reserved.